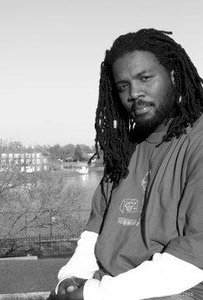 Derrick Weston Brown (1976-) holds an MFA in Creative Writing from American University. He has studied poetry under Dr. Tony Medina at Howard University and Cornelius Eady at American University. His work has appeared in such literary journals as Warpland and DrumVoices, and the online journals Capital Beltway and Howard University's Amistad. His work has also appeared in The Washington Post and New Orleans Times-Picayune newpapers and the anthologies, When Words Become Flesh ( Mwaza Publications), Taboo Haiku ( Avisson Press), and Gathering Ground: A Reader Celebrating Cave Canem's First Decade (University Of Michigan Press). He is a native of Charlotte, North Carolina, and currently resides in Mount Rainier, Maryland. He is the Poet-In-Residence at Busboys and Poets bookstore and restaurant.